There's a general consensus that remakes are destined for failure. If a movie has been made before, doing it over is just a recipe for disaster. But I say "nay nay". Now, if it's a classic film, that was done as close to perfect as you can get the first time around, then you really are better off leaving things be. Sure, you might manage a success if you're really lucky (with a little talent to help), but the odds are truly against you. Leave the classics alone. But there have been thousands of movies made over the last 80 years that were great concepts, or themes, or ideas, but failed to some degree in execution. Oh, they might not have been awful, but they were less than what they could have been. These movies can be remade with some luck and talent, and a great idea can be turned into a great film, regardless of the previous attempt. Two great examples of this are the B horror movies The Thing from Another World and The Fly. Both movies were made during the 1950's, and both were interesting concepts. But while the story was great, the acting and writing were standard 50's B horror movie work, not to mention the special effects. It took thirty years, but both movies were remade in the 1980's, and both remakes were great improvements on the originals. While they retained the general concept of each, they improved on the story line and added great acting and stellar effects. 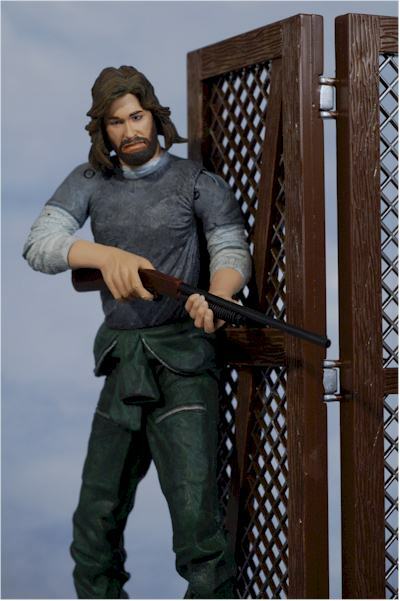 SOTA Toys picked up the license on The Thing, the shortened name of the 1980's remake from John Carpenter. The film starred Kurt Russell along with a gang of solid character actors, and is arguable Carpenter's best overall work. 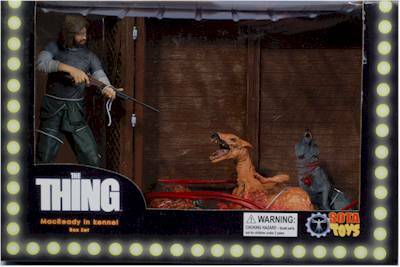 The deluxe set for Now Playing series 3 depicts R.J. MacReady (Russell) as he attempts to kill the alien as it assimilates several dogs in their pen. The set retails for around $25 - $30, and should be at many online retailers very soon if not already. While the box is a bit plain - going with the standard 'bright lights' movie theme - the set itself is nicely displayed inside. It's a set up that allows the MIBBers to show off the set well, but that layout comes at a price. There's about 784 twistie ties required to hold everyone in place, along with half a roll of Scotch tape. Be prepared to spend some time freeing this set from the plastic prison. 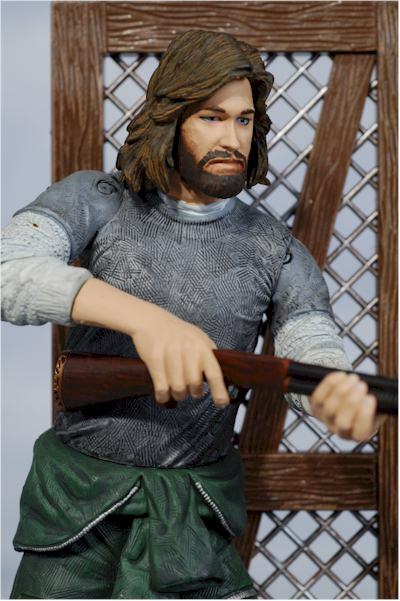 If I were grading this sculpt purely on the Kurt Russell likeness, it would be a slightly lower score. It does look like a younger Russell from certain angles, but from others the likeness isn't as strong. That's particularly true from straight on, and this is due in part to what appears to be some manufacturing issues. The head and face has a slightly malformed appearance to it, and this is usually associated with pulling the pieces out of the mold a little too soon, before they're completely set. This is the sort of issue that drives the poor sculptors nuts. The beard and hair work is solid, but again, from certain angles the hair separate hair piece looks more like a hat than a natural part of his head. The general detail on the body and clothing is good, with some nice texturing to distinguish the different types of material, and some good flow to the wrinkles and folds. Mac can actually stand on his own, although he has a peg in the base and a matching hole in the bottom of his right foot. His hands and arms are sculpted to hold the shotgun, and they do that well, but won't look particularly good in any other pose. All of the dogs look terrific from a sculpting perspective, and help boost the score up a bit. I'm going to count the alien dog as part of this sculpt score, but I'll be counting the other two partially assimilated pooches under the Accessories section. The alien dog has some great detail work in the face and mouth, and the texture of the grotesque skin is fairly good as well. Unfortunately, the paint doesn't hold up it's end of the bargain, and doesn't do much to show off the good sculpt work. One negative for the putrescent pooch is the lack of all his tentacles. There's actually holes for three or four more, in addition to the four he has. Since those holes are there, the exclusion of these tentacles was obviously a last minute cost cutting move, but the empty holes are quite obvious and detract from the overall appearance of the dog alien. The tentacles themselves can't be attached directly to the other two dogs, but you can wrap them around them or place them in strategic ways to make them appear attached. These are in supposed to be a 7" scale, but Mac is a bit large at about 7.5 inches tall. While some areas might get a lower score than the Paint section (like Articulation), the Paint score is the one that hurts my overall assessment the most. There's enough sloppy work, and enough cutting back on the number of operations, to hurt the set overall. Mac isn't too bad, but his paint job is fairly average. In fact, it's a bit more mass market in quality than specialty market, especially in areas like the forearms and face. The injured dogs both look pretty good, particularly the one who still has his fur, but the alien mutt is a little too plain and consistent across his body, making him seem more toyish and less realistic than you might expect. 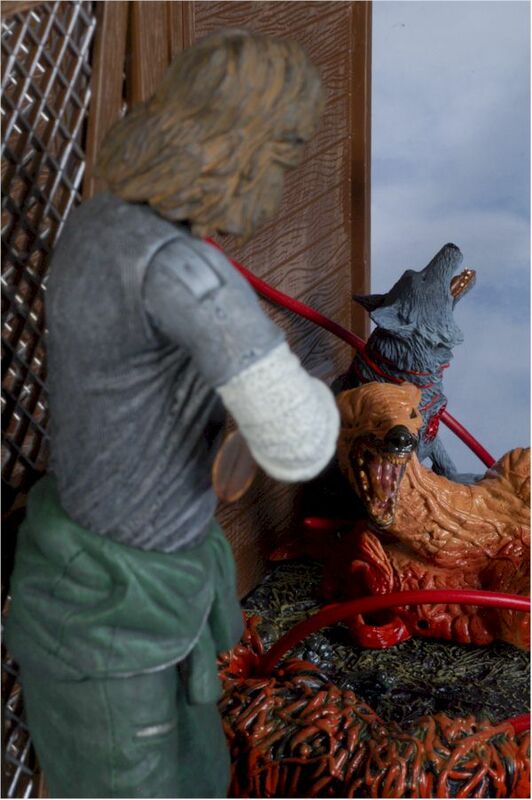 But perhaps the biggest issues lie with the kennel diorama. It looks like two very different people painted the two sections of stray laden floor, and two sections of wooden wall. 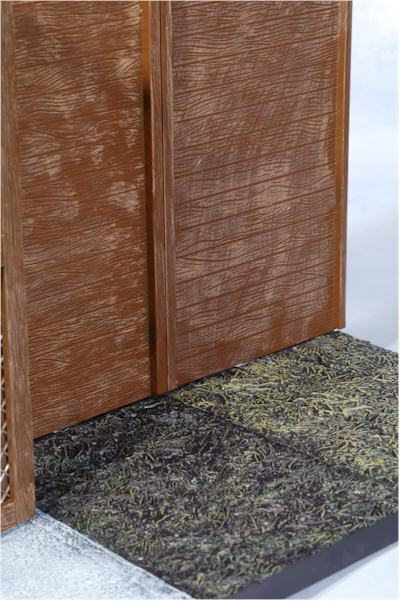 The left most chunk of kennel floor has much darker colored straw, almost a grass green, while the right most section has a lighter yellow, straw colored straw. There's no gradual shift between the two colors, and it looks really odd. Then if you check out the back wall, you'll notice that the wash on the left side is much darker, and much heavier. It looks like the wash color on the right side has been almost completely wiped off, whereas it's all over the left side. Again, this weird dichotomy really stands out, just as much in person as it does in the photos. The basic articulation is rather limited, and the set is really designed to look good in one pose. Mac has a jointed neck, but it's the pin/plate style that was popularized by Marvel Legends. This joint allows the head to turn, and to move forward and backward, but only straight forward and backward. The neck post itself remains stationary, so Mac's head can't actually be tilted in the proper direction to be shooting the dogs. Instead of being able to tilt it toward his left shoulder, it has to tilt down towards his chest. From a side angle, this looks okay, but if you look at Mac straight on, it looks rather odd. He also has ball jointed shoulders, cut elbows and cut forearms, but these joints are really intended to get his arms in position to hold the shotgun. You can adjust it a bit - you'll notice in the photos that he has the stock higher or lower against his body, and you can pose the dog closer or further from him and get him in a pose that works either way - but I never did get it in quite the perfect spot. It's a minor nit, but if he can really only hold one pose, it would be nice if he could do it perfectly. He has a cut waist and cut ankles, which wraps up his articulation. The dogs have no joints, and the alien tentacles aren't bendy, but simply soft rubber. The set itself does have an articulation point - the hinges on the kennel door. It can be shut, or swing all the way open. I appreciate that, because I can use the kennel itself for some other diorama possibilities if I'm so inclined. 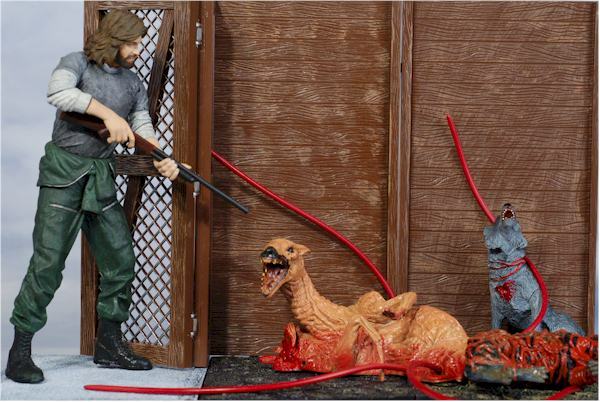 I'm counting the two extra dogs, the diorama base and the shotgun as accessories, with the Mac and the alien/dog being the main figures. Hey, you split it up your way, I'll split it up mine. The shotgun looks good, with a reasonable sculpt and an average number of paint ops. It's a decent enough scale, and while it doesn't knock your socks off, it doesn't detract from the overall appearance of the set either. The dogs are extremely nice, although they do suffer from some of the basic paint ops problems. 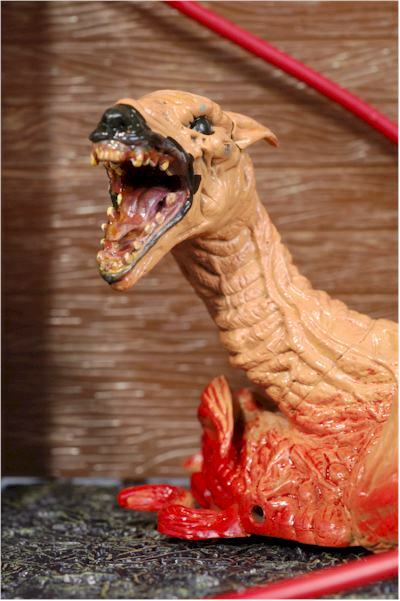 Both sculpts are cool looking, with one dog in far worse shape than the other, but neither in an enviable position. The scale is also quite good, matching up nicely with MacReady. When things get shrunk down, they tend to be made too large in proportion to the human figures, but I think these mutts are just about the right size. They also fit nicely on the size of the diorama, and nobody has to hang off the edge. I've already complained about the paint work on the diorama up in the Paint section, but it's worth noting again. It's less noticeable when the figures are present, but the inconsistent colors and weird wash on the background are certainly still obvious enough to detract from the appearance. However, the scale of the diorama is pretty good. It could be a smidge taller, so that Mac's head isn't quite that close to the top, but that's a minor nit, and there's plenty of room side to side and front to back to set up a good looking scene. While the set is decent, it's not going to be particularly fun for any kids. The subject matter doesn't lend itself too well to any play scenarios, but I suppose if you pulled the dogs, both the kennel and MacReady might find a home in the toy box. This set is running $25 - $30, depending on the retailer. At that price, it's in the same general ball park as sets like the cursed Jack and Barbossa, or the more recent Highlander set. The overall manufacturing quality of the set doesn't put it in the same league though, and comparing these sets really does highlight the general issues. Everything is pretty sturdy, but you will want to take some care with the forearm swivel joints on Mac. Mine were paint stuck, and the pegs can easily be twisted off in the forearms when that's the case. All of the major issues we're seeing on this set - the funky paint inconsistencies, the slightly deformed face, the exclusion of several tentacles on the alien - are all signs of last minute cost cutting. That is a possible sign of cash flow issues for SOTA, which isn't surprising in this tough period for all toy companies, but which I certainly hope they can find their way through. If this were another company other than SOTA, the level of manufacturing quality might not be a big surprise, but to be honest, collectors expect more from SOTA. They've created a great reputation with the early Now Playing stuff and the terrific Street Fighter line, so it's even more obvious when something of theirs doesn't live up to past work. Let's hope that this is just a blip on the radar screen of issues, and that moving forward they'll be able to get back to their earlier success. - Amazing Toyz has it in stock at $25. - CornerStoreComics also has it in stock at $25. - Dark Figures has him listed at $28. - Killer Toys has it listed (as a pre-order) for $30. - both the huge Lord of Darkness and Pumpkinhead figures from SOTA this year were part of the overall Now Playing line. - then there's the series 1 (which included Darkman and the Nightmare Demon), and series 2 figures and series 3 figures of the regular Now Playing line.